On Friday, after dinner at the Curry House, Robyn, Noelle, and I walked across the street for dessert at…Bubbies! Man, if Bubbies had a location in NYC, there would be no other place I’d rather visit for ice cream. Their lychee flavor is excellent as is the green tea, oreo and rocky road. We’ve got nothing like this in NYC. There was a goal for this particular visit: “Eat My Balls.” It’s listed on the middle-right of the menu. The names of these ice cream sundaes, pieces, cakes, etc are a bit perverted :/……. …I could go on, but I think you get the idea. What exactly is EAT MY BALLS? $17.50 for ONE SCOOP OF EVERY FLAVOUR. 16 flavours in total. Flavour options change on a daily basis – what you see on the board is what you get. Tah-dah! They weighed it out, and it came to 1.5 Pounds of ice cream! Shared between three people, that’s only half a pound each. Not toooooo excessive, eh? “Eat My Balls,” would be much more delicious if the fetal scoops were laid side by side on a plate as opposed to piled atop one another on a bowl. It was warm inside Bubbies and the ice cream melted quickly. We lost our appetites once it melted into a single indiscernible mass. 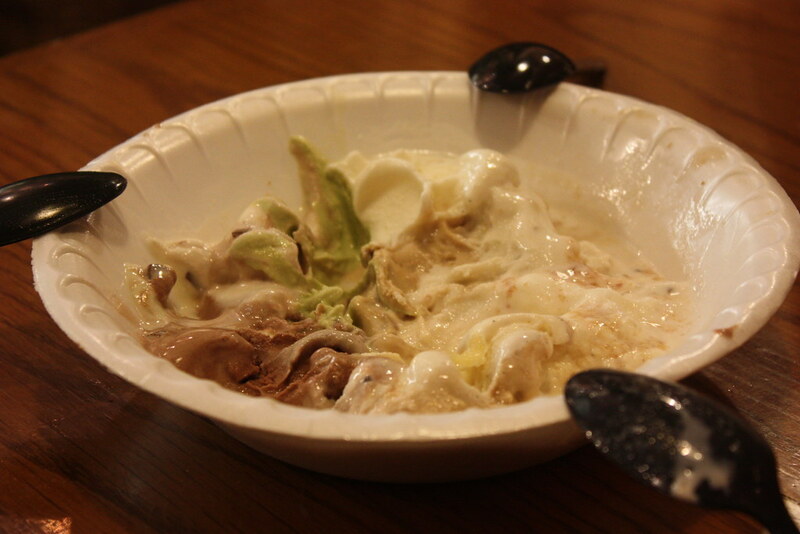 About 75% was consumed…we surely would have made it to 100% if the flavors were separated from one another! Sushi buffet time! The only state where I’d be excited to indulge in a sushi buffet is Hawai’i. We seem to have an abundance of Japanese buffets spots…Makino Chaya, Todai, etc. I’ve been to them all before, but this was my first visit to Kats Sushi. $20, all you can eat. Kat’s does their buffet a little differently. You order off a menu, and they bring the sushi to you. You have to finish everything before ordering more. AND. If there are any leftovers, you get charged a la carte prices. Talk about pressure! But also a good way to minimize wasted food. The restaurant is super tiny, just a bar that could seat about six, and four small tables. I went with Robyn and Noelle on a Monday evening, the place was about half full at 7. Reservations recommended for groups larger than two. It’s BYOB too :) They started us off with a complementary grilled butterfish collar. So ono. We ordered handrolls for the first “round.” Cannot recall the names of all the rolls we ate, but there was definitely ikura, tuna, spicy salmon. All the basics (minus natto ;)…the options here aren’t too adventurous. As for quality? Of course, not as good as many sushi bars in town. Decent, but very thin cut fish, plenty rice, you know the drill. But don’t forget – it’s a buffet! And for $20 all you can eat sushi, how can you complain. This is our third and final round. We didn’t intend to order so much – make sure to read the fine print at the bottom of the menu. Nigiri comes two pieces to an order…and they thought each of us wanted one order :/ We were so stuffed towards the end…there was NO POSSIBLE way to finish those last few pieces. …but I still had room for dessert! Hehe. We stopped by Bubbies on the way home. One scoop of Rocky Road for me. Noelle had the Green Tea, and Robyn was much too full!! No worries, we made a return trip a few days later! …and Chocolate Cake (my personal favourite)! Hiii! Sorry I have not made a “real post” in so long. Just got back from Hawai’i earlier this week and it’s been non-stop hectic (that’s what happens when you take two weeks off from work ;). And how was Honolulu? Amazing, as always!! Loving seeing my family, and this trip was extra special because I had aunts and uncles visiting from Paris and San Francisco for the week one. And then Robyn came in from NYC for week two! We flew back to NYC together…my first time doing a direct flight from HNL -> EWR. Just a few things on the checklist…a mish-mash mix of Hawai’i and NYC…I hope to be posting more regularly soon! ONE. I have a new listing! 46 Mercer Street (with private entrances on both Mercer and Broadway). A gorgeous, Soho loft, asking $7.2M. It’s definitely one of a kind. 5,000 square feet, with NSEW exposures. The space is stunning and the potential? Endless! Let me know if you have anyone interested!! TWO. The photo at the top of the post, and this photo is taken from Puu Ualakaa State Park, right off Round Top Drive on Tantalus. I had no idea this park was famous till I did a bit of research…it’s where Elvis takes his girlfriend to picnic in Blue Hawai’i! How neat is that?? Apparently Obama used to picnic here a lot with his grandma as well. The sight is stunning – a panoramic view of south Oahu going from Diamond Head past Waikiki, Aloha Tower area, all the way to the airport. THREE. Mochi Cream shop in Shirokiya CLOSED :[ I blogged about mochi creams back in 2008…my mom and I ate so many of these. We always made an excuse to pass though this section of Shirokiya whenever possible…you know, mochi creams for the road! We just happened to be there on 5/9, and there were signs up noting that it was their final day. They were selling all remaining mochi creams for $.99 (usually is $2/piece)…so of course we bought them all out. Ahahahah. We shared them with the rest of the family at dinner at grandma’s house that night. They have been replaced by Mikawaya…which…well, isn’t nearly as good :/ Mikawaya is mochi ICE CREAM, as opposed to mochi CREAM. To their credit, a pretty wide selection is offered, including a whole mochi gelato line. …will not only miss Mochi Cream’s product, but their packaging as well! FOUR. FINALLY visited Cake Works, owned by Abi Langlas. I worked for Abby one summer when I was a bakery at Honolulu Coffee Co. Remember that time I forgot the sugar in the bread pudding recipe? Yes, that summer! Robyn and I shared the Lilikoi-Mandarin Chiffon Cake. It was so lovely, and an excellent deal at $3/slice. Here’s a photo of the whole cake. 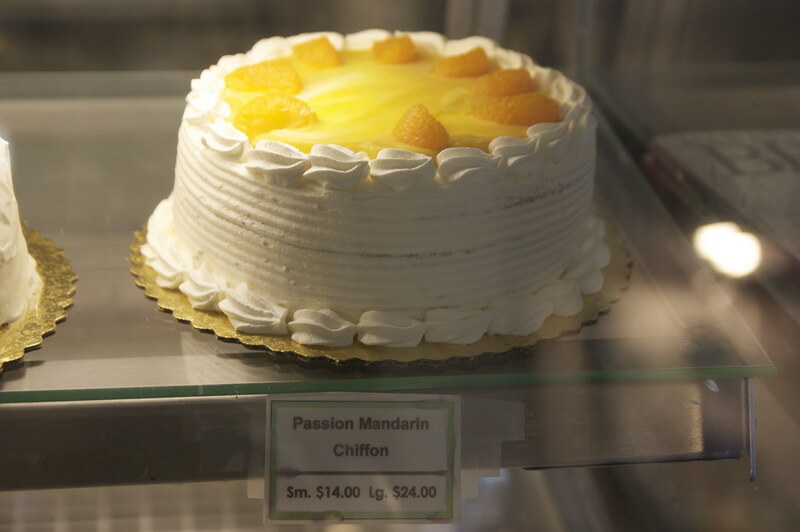 It’s a shame local style chiffon cakes aren’t more popular in NYC. They’re the perfect warm weather/summer cake. Light and airy, you won’t feel a thing in your belly. The cool layers of cream is sweetened slightly, mandarin orange-studded, and topped off with lilikoi curd. Ah. NYC bakeries ought to take more inspiration from local bakers!! …and straight to Nobu Waikiki where pastry chef Rachel Murai put together a six course dessert tasting…sous vide watermelon, espresso snow and sweet milk, azuki panna cotta, more surprises to come! You can find photos from the evening here and here…I’ll also do a full post on the meal soon. Ok! Aloha! Going sleep now :) Hope everyone has a great weekend!